Ridge Ruin Side-notched point, Wupatki National Monument. 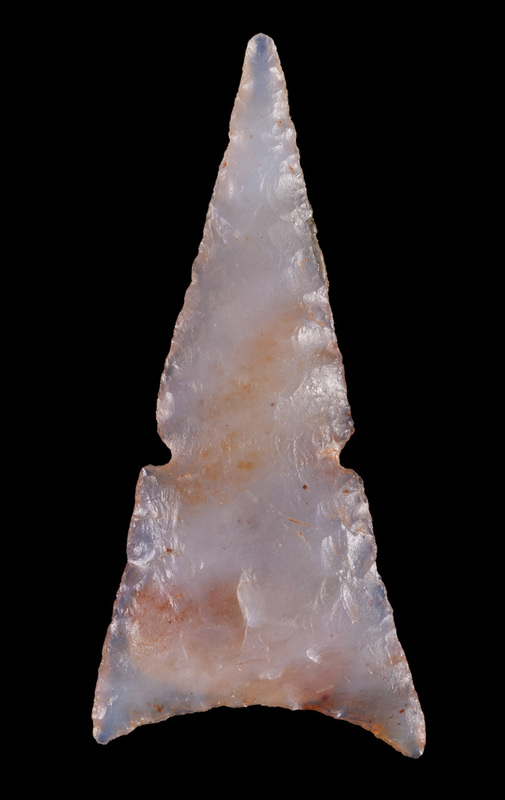 Click the image to open the Pueblo Side-notched, Concave Base gallery. Date Range: A.D. 1050 – 1300/1500 (Justice 2002; Sliva 1997). Size: Generally less than 30 mm long. Shape: Isosceles triangle; straight blade margins; side-notched; delicate tips. Cross-section: Flat to flattened oval. Base: Straight to concave; sharp corners. Flaking: Pressure; random. Thin flake blanks used as preforms, so some areas may not be flaked. Notching: Small, narrow, and horizontally placed (except for the Ridge Ruin variety, which has downward slanting notches); sharp angles. Materials: Chert, obsidian, and chalcedony. Ridge Ruin Side-notched – high-set notches set at a downward angle; with the exception of Walnut Canyon Side Notched, larger than others in this point class; A.D. 1150-1220/1300. Walnut Canyon Side-notched – similar in size to Ridge Ruin Side Notched, but with a deep concave to V-shaped base, occasional constricting basal ears, and horizontally placed notches. Point of Pines Side-notched – thin and delicate, with very high-set side notches and quality flaking; A.D. 1150-1300. Other Names: Classic Side-notched; Early Classic Side-notched. Comparisons: Desert Side-notched points are similar; although Justice (2002) includes Awatovi Side-notched in the broad Pueblo Side-notched category, these are morphologically and temporally akin to the Sierra variety of Desert Side-notched points; both are distinguished from other Late Prehistoric side-notched points by the presence of a basal notch.